Man, this deck is FUN. To play. And only to play. If you play against it, well, YOU’RE GOING TO HAVE A BAD TIME. If this deck gets WUBRG, which is very consistent with all the ways to get mana or change it’s colors, it is just game over. 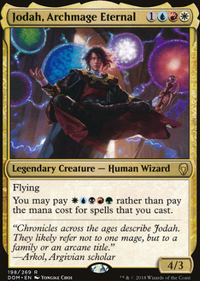 Use Jodah, Archmage Eternal to just cast anything and everything for so much value. It’s even more fun and completely bonkers with Sunbird's Invocation out. Even though you only pay WUBRG to cast things, you can get an effect that’s pretty much better cascade for up to 12. 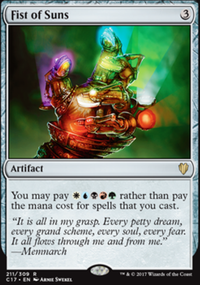 Some of the huge cards you don’t need Jodah or the Infinity Gauntlet out to cast, but WUBRG is still a requirement. It’s also super easy and fun to get WUBRG when you have either Chromatic Lantern or Joiner Adept .